Online Therapy That Works - Start Getting Happier Now! This is not just a quick-fix to make you smile right now. You'll get all the support and tools you need to feel better over the long-term. 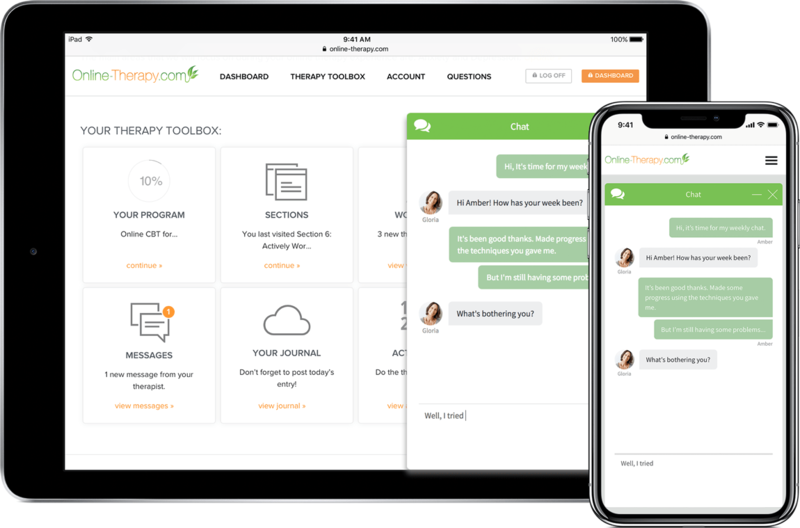 It’s exciting to be associated with Online-Therapy.com and its mission to bring high quality therapy access throughout the world, to those who might otherwise not be able to obtain necessary emotional support. Dr. Elizabeth Lombardo is frequently interviewed by today’s top media outlets including; The Today Show, Dr. Oz, The Steve Harvey Show, Fox News, CNN, Forbes, Wall Street Journal, Money Magazine, Health, MSNBC and USA Today. Your personal therapist will be by your side - from start to finish. Guiding you to a happier you through the sections, worksheets, live chat and messages. You can do this from wherever you are in the world. Are you a therapist? Join us today! Start talking to your therapist today! Like chapters in an interactive book! Each section is comprised of both reading material and practical hands-on tools. It includes all the information that you need to identify, challenge and overcome your problems. There are several worksheets in each section. 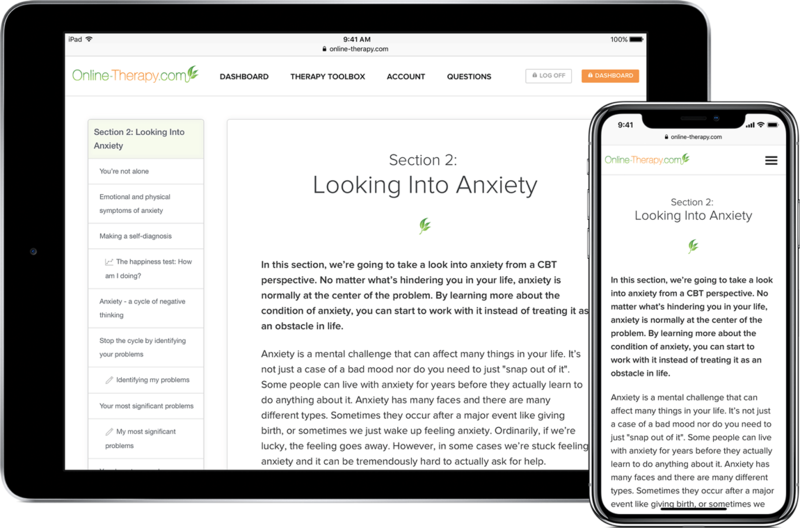 In each worksheet you will answer questions and get valuable hands-on tools and tips from your therapist on a daily basis. Get instant support and feedback through the chat! Each week you will have access to 30 minutes of live chat with your therapist. This is a perfect opportunity to get instant guidance and support. 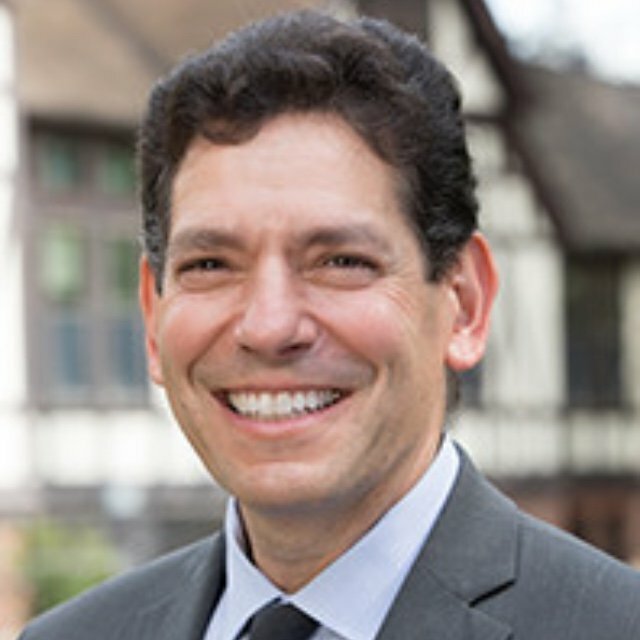 In addition to communicating with your therapist through the worksheets and the live chat, you can always send them a message with any questions or thoughts. Whatever’s on your mind, just send a message! Helps you to start and end your day on a good note! This easy-to-use journal helps you start and end your day in a more positive way. You will soon notice a big difference in your attitude towards yourself and life by just writing a few notes each morning and evening. This is where you add and schedule the things that will add extra light into your life! The activity plan also serves as a written agreement with yourself. It greatly increases the chances of you carrying out your plans! Our happiness philosophy is: do something each day that brings you joy! Check out the intro video with our yoga teacher Petra. This is the latest addition to our ”happiness-toolbox”! These simple videos are perfect when you need help coping with your depression, anxiety or stress. They are perfect when you need an instant boost of gratitude and happiness. We’re here to help you get happier NOW! Your therapist is ready to start the journey with you today. So what are you waiting for? We’ve helped thousands getting happier since 2009! 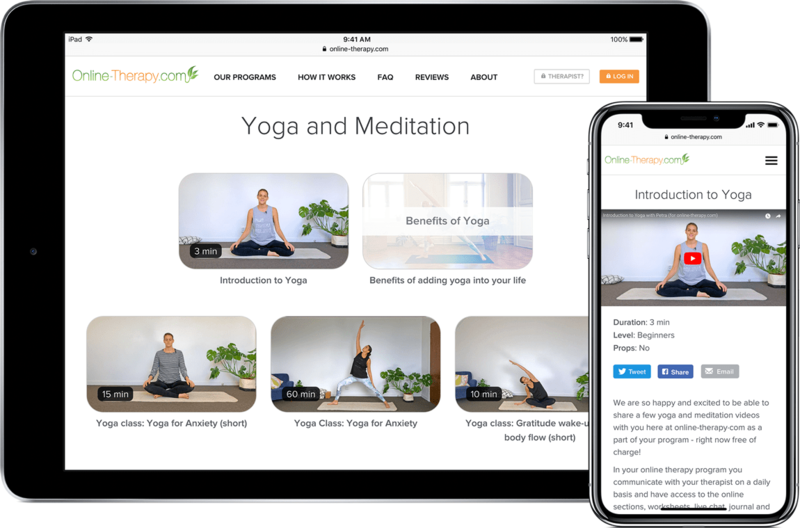 Why should I choose Online-Therapy.com? We’re not like other therapy websites! You get all the tools and support you need to be happier - now and in the future. Our program is based on proven, well-researched treatments drawn from CBT. Our therapists are highly qualified with a wide range of credentials. Your therapist is here for you whenever needed, Monday-Friday. You pay much less than you would with a face-to-face therapist. We respect your privacy! There is no risk of exposing yourself face-to-face in the therapist's office or waiting room. All your information is saved anonymously on our secure server, where only you and your therapist can access it. There is no hassle with traveling or keeping an appointment. You can get help from wherever you are in the world. All you need is a computer, tablet or mobile phone. Get life-changing support from the comfort of your sofa! Choose one or more areas that you are experiencing difficulties with. We are here to help you and make your life better, starting today. Our platform is private and secure. Your personal details will be kept safe. Choose your areas of concern to get matched with your therapist. Choose the subscription plan that best suits your needs, starting at just $31.96/week. 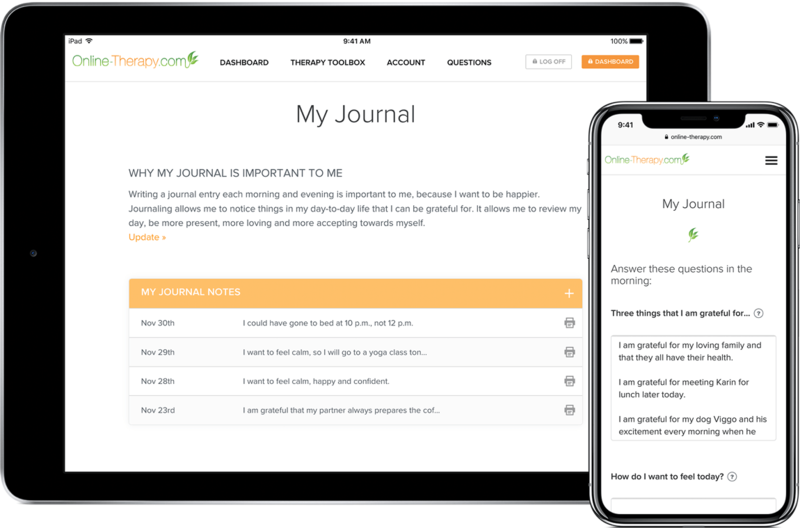 Get instant access to your online therapy program, including sections, worksheets, diary, activity plan and more. 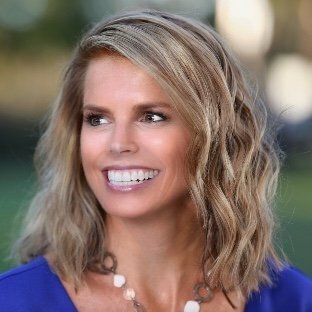 Start communicating with your therapist through worksheets, messages and live chat. With the help of the tools and the support of your therapist, you will start getting happier, day by day. It only takes a minute to get started! Take our quick happiness test! Let’s get started and see if we can help you! 1. I don't feel satisfied with my life. 2. I feel sad or low, without really knowing why. 3. I don't feel that I'm in control of my body and mind. 4. I feel stressed and tense. 5. I experience mood swings. My mood and behavior are unstable. 6. I feel anxious and often experience racing thoughts. 8. I feel like there is nothing I can do to stop the worrying, even though I know my thoughts are irrational. 9. I only see the negative aspects of things. 10. I'm afraid of what awaits me in the future. 11. I have feelings of hopelessness. I don’t think that my situation will ever change. Get instant results and recommendations! Our online therapy program is based on cognitive behavioral therapy (CBT). CBT has been developed on the idea that your thoughts are what cause your feelings and behaviors, not external stimuli like people, situations and events. CBT is one of the most commonly used methods for treating mental problems. Studies show that online therapy based on CBT is just as effective as traditional face-to-face therapy. Any questions? Just ask, we’re here to help you! Are you unsure if we are the right fit for you or do you have any questions about our services? Our supporting staff is just a click away! Join the thousands that have become happier! Our online therapy service has received an average rating of 4.6 out of 5 stars. Now it’s your turn to get more joy in your life.